Almost exactly a year after announcing its merger with the National Patient Safety Foundation (NPSF), the Institute for Healthcare Improvement (IHI) is rolling out its planned activities for Patient Safety Awareness Week (PSAW). Running through March 17, the week is focusing on culture of safety and patient engagement. This is the first PSAW run by the merged IHI-NPSF after 15 years as an NPSF-organized event, and the week has consistently grown in impact, says Tejal K. Gandhi, MD, MPH, CPPS, IHI’s chief clinical and safety officer. “We get a lot of great attention,” she adds. The week’s events kick off on Monday, March 12 with a complimentary webcast, Engaging Patients and Providers: Speaking Up for Patient Safety, scheduled for 1 to 2 p.m. Eastern time. Gandhi will moderate a panel featuring the following experts: Jeff Brady, MD, MPH, director of the Center for Quality Improvement and Patient Safety, Agency for Healthcare Research and Quality (AHRQ); Tiffany Christensen, vice president of experience innovation, Beryl Institute; and Gerald Hickson, MD, senior vice president of quality, safety and risk prevention, Joseph C. Ross Chair in Medical Education and Administration, Vanderbilt University Medical Center. The panel will discuss the importance of speaking up from the perspective of clinicians, challenges, and families. The program is free of charge, but registration is required. On Friday, March 16, the IHI (@IHI) is hosting a Twitter chat from 12 to 1 p.m. Eastern time called Building a Safety Culture. Governmental, advocacy, and professional organizations and individuals will share questions, challenges, and strategies to advance a culture of safety in healthcare. All are invited to participate using the event hashtag #PSAW18. In addition, the IHI encourages those participating in PSAW to share their activities throughout the week on social media and on the event website. Participants can go to the site and take a patient safety pledge, get ideas on how to engage staff and patients, download free resources, order branded materials, or honor a loved one impacted by a medical error. Gandhi says there has always been a willingness on the part of clinicians to improve patient safety, but other things sometimes get in the way. “There’s so many competing priorities for clinicians that it’s hard to get traction on patient safety,” she adds. Culture of safety has been a focus for years, but the results have been mixed. “We’re seeing a lot of attention, we’re probably making some progress, but there’s a huge way to go still,” notes Gandhi. 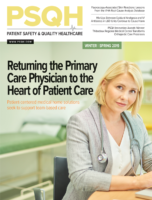 A recent survey conducted by the IHI/NPSF Lucian Leape Institute and NORC at the University of Chicago found that 21% of people report experiencing a medical error in their own care, with one third reporting an error in the care of a relative or friend. The survey of more than 2,500 adults was conducted by NORC last year. Nearly half of those who reported experiencing a medical error say they spoke up about it to a medical professional, but of those who didn’t, most said they either didn’t think it would do any good or they didn’t know how to report the error. One of the goals of PSAW is to convince healthcare professionals, patients, and families to speak up and report errors or ask questions about their care, says Gandhi. The survey also found that ambulatory settings are a frequent site of medical errors, which Gandhi says is important to note. “We have to really broaden our thinking about patient safety beyond the hospital walls,” she adds. Two recently released IHI reports, Closing the Loop: A Guide to Safer Ambulatory Referrals in the EHR Era and Patient Safety in the Home: Assessment of Issues, Challenges, and Opportunities, address these issues occurring in non-hospital settings.